We decided to go to Sweden by default. In late September, I still had not planned anything for winter break. A swift online search revealed that all of the predictable spots-skiing in Colorado, Caribbean, Hawaii, Mexico-had been already booked by parents more conscientious than me. So, I looked at less popular vacation options. Flights to Scandinavia on SAS were reasonable and activities abundant. Off we went. The first thing that blew me away about Stockholm was the astounding lack of grittiness. Taxis were spotless. Historic edifices were well maintained. There was no garbage or graffiti in sight. The city is incredibly accessible. Getting across town by cab or public transportation is simple, traffic nonexistent. Gaining entry to museums or events is effortless. And, the Swedes are incredibly friendly, a contrast to the less than enthusiastic welcome Americans receive in, say, Paris and London. Maybe that is because there were so few Americans in Stockholm. Though everyone speaks English, more often than not, I heard a melange of Spanish, Russian, Japanese and French. Food is critical to all of our trips. Breakfast in Sweden is outstanding: pancakes with lingonberry, farm fresh eggs with cheeses and charcuterie and gravlax. Other meals revolved around meat and fish (vegetables? not so much). During our week, we sampled moose, reindeer, beef and pork. On the seafood front, salmon, herring, mackerel and arctic char appeared in numerous iterations. My favorite meal was roe served with a tangy sour cream and buttered toast. Fika (a coffee/hot chocolate/pastry break) is a thing in Stockholm. Multiple times during the day, you pop into a cozy cafe to recharge with a hot drink and cinnamon bun. Fika (a coffee/hot chocolate/pastry break) is a thing in Stockholm. Multiple times during the day, you pop into a cozy cafe to recharge with a hot drink and cinnamon bun. 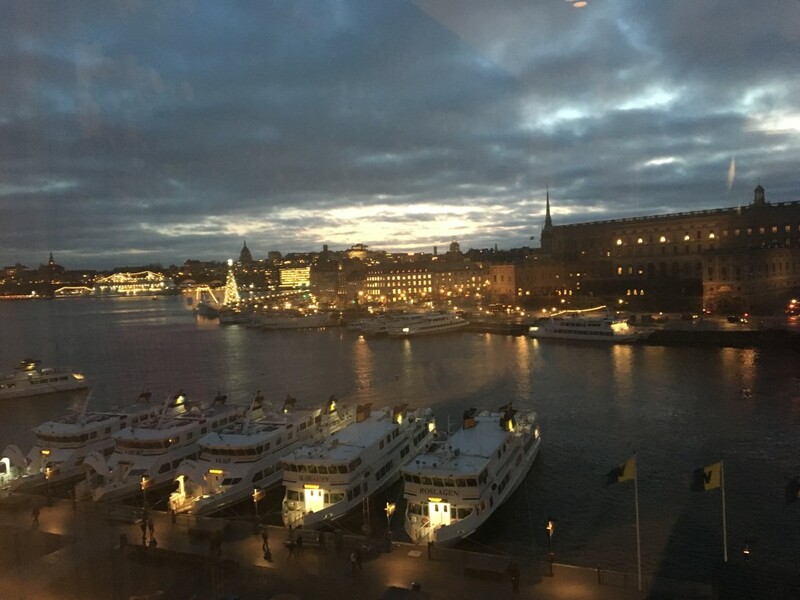 For lodging, we spent a few days at the waterfront Grand Hotel Stockholm and throughly enjoyed the sumptuous breakfast, the afternoon tea and the Nordic Spa. Then we moved to Ett Hem, a private residence in an elegant Arts & Crafts building turned 12 room hotel. Not only did this hotel delight the design lover in me (each room is different and boasts art and Swede-specific point of view like cozy sheep pelts, candles, Nordic floral arrangements) it delivered superb, personal service that really made us feel as if we were guests at a friend’s estate. Bonus: the basement has a mini spa/relaxation area for guest’s. Think heated marble slab, sauna, organic body oils and cold and hot showers. Truly sublime. Here are a few highlights of our week in Stockholm. Abba The Museum-Your kids may not know Dancing Queen, but they will love karaoke and seeing their parents’ resurrect killer 80’s moves in the space’s technicolor dance floor. Vasa Museum-A salvaged warship sunk in the 1628 (excavated in 1961) is available for viewing complete with audio stories. The Swedish Royal Opera -The stunning 18th century opera house is home to the Swedish Ballet and the Opera. We saw the Nutcracker. Check the schedule as they have many events for families and young children. Nobel Museum– In a square tucked within the narrow cobblestone walkways of Old Town you will find a museum dedicated to telling the stories of Nobel Laureates and their creative endeavors. There are hands-on activities and films to keep kids engaged. Food Halls–Our favorite stops were the food halls. Vintage buildings with stalls hawk produce, seafood, pastries, traditional Swedish fare & gourmet goods. This is the perfect place for lunch or a sugary pick-me-up. Spas-When the kids were chilling out, I hightailed it to some of the city’s famed Nordic Spas. Some are super modern. Others former communal bath houses in turn-of-the-century buildings. Most offer a combination of saunas, steam rooms, hydrotherapy pools and hot/cold plunge pools. You can have a treatment. Or, not. Sports Event- If you have boys, attending a sporting event in a foreign country is an excellent souvenir. My husband got a last minute ticket to a hockey game (I took my girls out for dinner) and it was a highlight of his trip.